Over 60 module positions to choose from, this template will ensure that you are in no way restricted when setting up your layout. Each position comes with a host of styling options allowing you to easily set custom widths and colors. 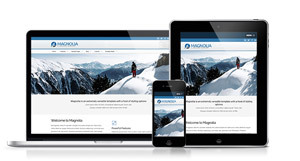 Fully responsive on all screen sizes, Magnolia will ensure your site and it's content will look perfect in all possible screen sizes. Fully achievable with minimal effort without compensating your control. Give your site the personal touch with a huge collection of styling options which allows you color control of almost any aspect of your design. No longer will you be restricted to template default colors, Magnolia puts the artists brush back in your hands. Typography is a breeze with a host of font sizing and family options. Choose from over a 100 Google fonts for all the main elements of your site including individual options for body, menu, titles and headers. Optimzed for SEO and speed. In todays world of mobile internet access we have ensured that Magnolia is super fast. Never will your template load a script or dependency unless it is required. Up your web design game today with the Magnolia Joomla template!